The L and Report 100 Collier, the family once owned more than 1 million acres in the Sunshine State. Total acreage has dropped, but the descendants' holdings and their respective companies have grown to include everything from oil production and agriculture to mineral management and real estate development. Kokernot Heirs 278,000 acres Among the most storied ranches in Far West Texas, the o6 brand was registered as early as 1837. It was purchased by John Kokernot in 1872, who, with his brother Lee, began grazing cattle on open range west of the Pecos. In 1912, Lee's son, Herbert Lee Sr. (1867-1949), began to piece together the immense property now known as the o6 and the Leoncita Cattle Company. Anne Marion 275,000 acres The only daughter of "Miss Anne," Ms. Marion is president of Burnett Ranches, which owns the Four Sixes Ranches. Her great-grandfather, Samuel "Burk" Burnett, founded the ranch in 1868. Numerous ru- mors have sprung up about the 6666 brand, including a tale about a winning poker hand. The truth is the pioneering rancher bought 100 head of cattle from Frank Crowley, and every one of them wore the 6666 brand. Babbitt Heirs 270,000 acres In 1886, five Babbitt brothers arrived in Flagstaff from Cincinnati and began one of the most storied livestock operations in the Southwest. Babbitt Ranches cattle graze on private and public lands with views of the Painted Desert in one direction and the Grand Canyon's North Rim in the other. Quarter Horse aficionados pay particular attention to the family's annual colt sale, which is overseen by fourth-generation family member Bill Cordasco. 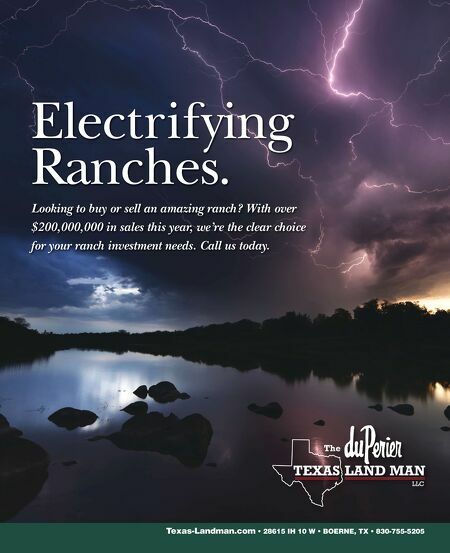 Llano Partners 265,000 acres Llano is a Texas-based family partnership owned by the Abell family of Austin, and is managed by Hughes Abell, founder and general partner. Its farm and ranch holdings span Texas, New Mexico, and Florida. Mike Smith 263,066 Acres Mike Smith has amassed significant holdings in the Texas Panhandle and Eastern New Mexico. The majority of his acreage is farmland and grassland. Smith, who is based in Amarillo, also has holdings between Dallas and Waco. D.R. 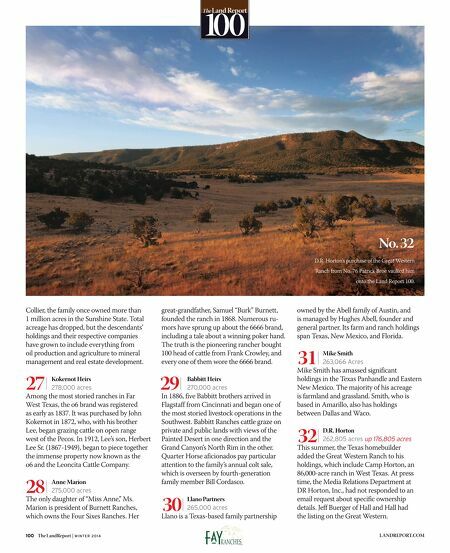 Horton 262,805 acres up 176,805 acres This summer, the Texas homebuilder added the Great Western Ranch to his holdings, which include Camp Horton, an 86,000-acre ranch in West Texas. At press time, the Media Relations Department at DR Horton, Inc., had not responded to an email request about specific ownership details. Jeff Buerger of Hall and Hall had the listing on the Great Western. 100 The LandReport | W I N T E R 2 0 1 4 LANDREPORT.COM 27 | 32 | 31 | 30 | 29 | 28 | No. 32 D.R. Horton's purchase of the Great Western Ranch from No. 76 Patrick Broe vaulted him onto the Land Report 100.